Ian Thomas, founder of SeePhillyRun, a new tour service for the fleet of feet. There is no more crushing feeling than learning that your dream job is out there, and someone else has it. These were my sentiments upon fielding a call from Ian Thomas, who informed me earlier this week that he is a tour guide. A running tour guide. 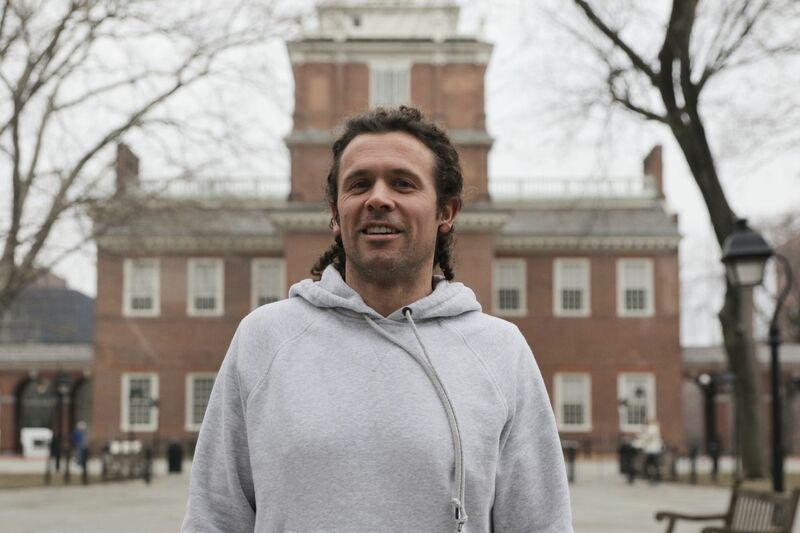 Ian Thomas, 39 and a father of two from South Philly, is founder of SeePhillyRun, a new tour service for the fleet of feet. Basically, you run a three- to five-mile course around the city, led by Thomas, who stops to explain various historical sites — or, if you’re hitting a good stride, just shouts over the din. We met Thursday in a coffee shop across from Washington Square. Ian Thomas, founder of SeePhillyRun, offers your columnist one of his running tours of Philly. Like me, he’s a transplant. He moved to Philly in 2002 — he’s originally from Nebraska, but his full-time job as an international supply chain consultant has included stays in Europe. He’s an obsessive runner who’s finished five marathons and run in a 60-mile race through Belgium. Now he fancies himself a defender of the wounded Philly psyche – if not a native son, then a proud adoptee. Thomas has the look of an `80s calisthenics instructor, with caveman curls, blue running shorts, and American flag fanny pack, where he keeps his red “Rocky” headband. There are bigger, corporate companies that offer running tours, but Thomas’ solo venture has a particular charm. For $25 (the beer run’s more), he tries to offer city history in the same way we process information now: pithy, conversational. He is running, after all. Thomas has history chops, earning his guide pin from the Association of Philadelphia Tour Guides, whose training program has become a national model in recent years, and which I can say is no walk in the park. He’s given about 60 tours since getting started in October. Besides tourists and city-interested suburbanites, Thomas, who has an MBA from Temple, is gearing his educational runs toward local businesses as team-building and wellness exercises. As happens during a run, a Zen-like feeling soon washed over me. I was jogging and learning, learning and jogging, padding through Philadelphia in the footsteps of my founding fathers — Washington, Franklin, Kevin Bacon’s dad — in my worst sweatpants, as God and Philly intended. Fueled by the spirit of my ancestors and several cans of Red Bull, I felt no pain. To his credit, Thomas runs at a casual pace so even newbies can keep up. As we approached Rittenhouse Square, the final stop on our jaunt, Thomas sought to drive home the real narrative of his tours — that we live in a city founded on lofty ideals, and that we proceeded to spend the next 300 years abandoning them, ignoring them, and finally trying to live up to them. That we’re a complex city, with a lot going on — and one trying to inch toward the promise of those ideals. Plus, if you take his “Rocky” tour, you get a free red headband at the finish.